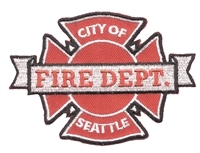 3389 - SEATTLE FIRE DEPT. souvenir embroidered patch. 2.5" tall x 3.5" wide. Patches sew or iron-on & are carded for a retail display for stores. 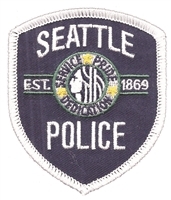 3386 - SEATTLE POLICE souvenir embroidered patch. 3" tall x 2.5" wide. Patches sew or iron-on & are carded for a retail display for stores. 3399-01 - SEATTLE rainbow gay pride flag with a black border embroidered patch. 3.625" x 2.25". Patches sew or iron-on & are carded for a retail display. 3399-39 - SEATTLE rainbow gay pride flag with a white border embroidered patch. 3.625" x 2.25". Patches sew or iron-on & are carded for a retail display. 3396-01/39 - Seattle script (cursive). 4" wide x 1.5" tall. Iron-on backing. Patches sew or iron-on & are carded for retail rack display for stores. 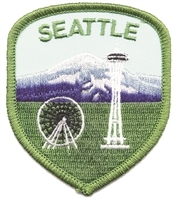 3356 - SEATTLE space needle embroidered souvenir patch. 2 3/16" wide x 2.875" tall. Patches sew or iron-on & are carded for a display rack for retailers. 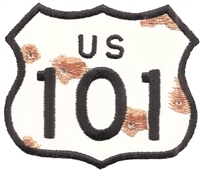 8101 - US 101 highway sign embroidered patch. 2.5" tall x 2.875" wide. Patches sew or iron-on & are carded for a display rack for stores. WA-51/39 - WASHINGTON eagle souvenir embroidered patch. 3.125" wide x 2.375" tall - Patches sew or iron-on & are carded for a retail display for stores. 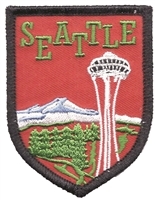 WA-61 - WASHINGTON indian souvenir embroidered patch. 3" - Patches sew or iron-on & are carded for a retail display for stores. 3352 - WASHINGTON large state flag shield uniform or souvenir embroidered patch. 2.75" wide x 3.5" tall - Patches sew or iron-on & are carded to hang on a display rack for stores. 3362 - WASHINGTON mylar flag shield souvenir embroidered patch. 2.625" wide x 3.125" tall shield - Washington state flag. Patches sew or iron-on & are carded to hang on a display rack for stores. 3370 - WASHINGTON shoulder tab souvenir embroidered patch. 3 13/16" wide x 1.375" tall - Patches sew or iron-on & are carded for a retail display for stores. 3351 - WASHINGTON small flag shield embroidered patch - 1.875" wide x 2.625" tall - Patches sew or iron-on and are carded to hang on a display rack for stores. 3354 - WASHINGTON state flag embroidered patch. 2.25" x 3.25" wide - Patches sew or iron-on & are carded for a retail display rack for stores.